I have never received a Farthing of Prize Money either for Artillery Ammunition or Vessels. I received orders from Congress to proceed to Charleston in South Carolina, for the purpose of Co'operating with General Lincoln in the defense of that Capitol. Clair. Wallace wrote "You Abraham Whipple on June 10 1772 burned his majesty's vessel the Gaspée and I will hang you at the yard arm!" To which point Whipple responded "Sir always catch a man before you hang him. One such occurrence happened on June 9 1772 when Whipple led 50 Rhode Islanders in the capture and burning of British revenue cutter HMS Gaspée which had run aground off Pawtuxet while chasing the packet Hannah. 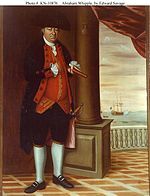 Abraham Whipple (September 26 1733 – May 27 1819) was an American revolutionary commander in the Continental Navy. Whipple was born near Providence Rhode Island and chose to be a seafarer early in his life. The first to unfurl the Star Spangled Banner in London he was also the first to sail an ocean-going ship 2000 miles down river from Ohio to the Caribbean opening trade to the Northwest Territory.